Dans le vol. XIII de la publication Oriental Herald and Colonial Review (1827), l’écrivain journaliste anglais James Silk Buckingham (1786-1855) relate sa visite au site de Guizeh. Photographie de Lichtenstern & Harari - Date : ? The Sphinx, which is situated a little to the southward of the first pyramid, was the next object of our attention ; and I was charmed with an inspection of it. How much did I regret the haste of the enthusiastic Denon's visit, and the impossibility of his making a perfect drawing of it on the spot ; for, independently of his merit as an artist, he seems to have caught all the impressions requisite for such a task. The plate given in Aikin's edition of his travels, is stiff, and painful in the attitude of the uplifted head and eyes, while the complacent ease and rather downcast features of the original is the very picture of satisfaction and repose. 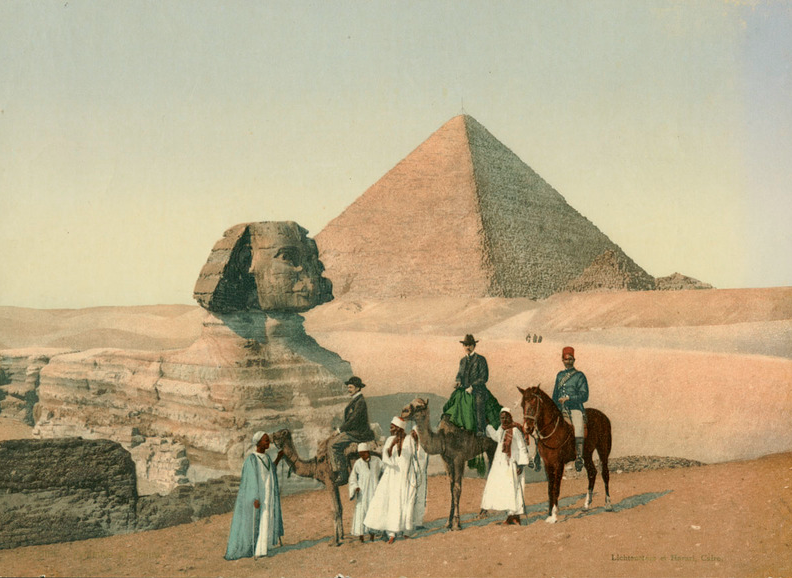 As far as we could trace it, the statue of the Sphinx is hewn out of one solid rock, the body being covered with the sand of the Desert, level with its back, on which we walked. Lines of red paint are still visible about the hair, which, from the complicated sculpture, appears to have been highly ornamented ; but the features are at this moment much mutilated, the superstition of the Mohammedans teaching them to despise all representations of animal life, and the Bedouins having a traditional hatred of Pharoah, whose tomb they believe the pyramid to have been, and this his image.